All information provided on the Mississippi Department of Agriculture and Commerce website is believed to be correct. However, no liability is assumed for errors in substance or form of any of the materials published on this website. Electronic versions of documents appearing on this site do not display the text of these documents exactly as the printed versions. The Mississippi Department of Agriculture and Commerce provides the information contained in this website as a service to the Internet community. The Mississippi Department of Agriculture and Commerce tries to provide quality information, but makes no claims, promises, or guarantees about the accuracy, completeness or adequacy of the information contained in or linked to this website. In addition, Mississippi Department of Agriculture and Commerce is not liable for information on sites that are linked to the Mississippi Department of Agriculture and Commerce site. 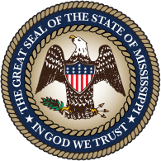 Further, the Mississippi Department of Agriculture and Commerce is not responsible for any content contained on sites that are linked to the Mississippi Department of Agriculture and Commerce website.